Profesional and timely communication, no hidden info. We are not going to charge you depending on the number of musicians. 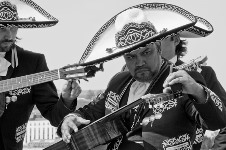 We will always try to bring you the Mariachi music as the one it is heard in the best squares in Mexico. Dancing could not miss as part of the Mexican folklore. The Group of Mexican dance "La Marquesa" is settled down in Slovakia and together with our Mariachi Band creates that real mexican atmosphere in you event. Profesional event management, car and limousine rental.